Hey there, you thought I forgot about y'all huh? No such luck. The beginning of the school year this year was more hectic than usual, but now I'm back to give you The Run Around. That's right, it's Coach Daigle here to feature The Bottom Six. What I call The Bottom Six is the 25 high schools in the bottom six, or coastal counties of MS. That's Pearl River, Stone, George, Hancock, Harrison, and Jackson. Now let's talk State Cross Country Meets. This year the 1A, 3A, 5A run Saturday. Let's look at the coast area teams - and highlight the individuals from The Bottom Six trying to reach the podium. The Resurrection Girls look to finish 9th overall in a virtual meet, and they are led by 8th grader Kennedy Williams. The teams to really watch out for in this race are Tupelo Christian Prep School and Myrtle High School, but according to their coach the Resurrection "squad is small but mighty" - and they won't go down without a fight. The boys from Resurrection are led by senior Max Laws and the computer has them finishing 10th at the meet. I'm hoping for a great finish for Resurrection - they are led by a quality coach and represent all the things that are good about our sport. 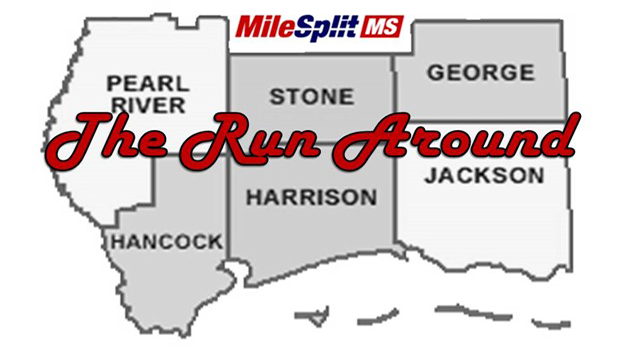 There's no "Bottom Six" teams in 3A this go around, but I'll take a stab at the races anyway. On the girls side look for Kossuth to lead the way, but don't count out Saint Andrew's - they've got a phenomenal 7th grader in Emily Ireland leading the way - oh yeah, she's my niece too. On the Boys' side I like Kossuth by a large margin. Long Beach's Brooklyn Biancamano leads the way here by almost 90 seconds. Her season best is 17:58.03 and I predict she'll be the overall winner pacing her team to a podium (top 3) finish. Long Beach's Ashling Osness should make it in the top 5, making her an All-State selection along with Biancamano. The Long Beach Boys finish at #10 in a virtual meet. They are led by youngster Brandon Griffith. His season best mark of 19:15.08 is the best for the Bearcats, but he's the only runner under 20 on the team. In a virtual meet Gautier girls place 15th, and are led by Hailey Collins and Emily Garcia. Hailey is looking to break into the 25's and Emily is looking for a time that is sub 26 - both would be season bests. The virtual meet has the Gautier boys finishing 20th. They are led by Enrique Martinez who has a season best mark of 19:09.00. The Pearl River Girls are vying for a top ten finish. The virtual meet puts them at #11 behind Lewisburg, but I'm pulling for the Lady Blue Devils to crack the top ten. Jade Shaw is the leader for PRC, she has season best of 21:25.30. If the team can rally behind her and drop some time, the PRC girls may find themselves in the top ten at the end of the day. You can't talk PRC Boys without talking about Cole Benoit. His season best time of 15:43.31 leads the state in all classifications. Despite that solid individual effort by Cole, the Blue Devils are picked 13th overall by the virtual meet. They can improve that mark if members of the team have good days. Look for Mark Lossett and Trevor Stuart to be they keys to a higher finish for the Blue Devils, they are both currently in the 19:30's range. The Picayune girls appear to only have 4 runners this season, so unfortunately they can't score as a team. We wish them the best of luck individually: Kagen McCurin, Jennifer Jones, Mary Thompson, and Anna Comeaux. The Picayune boys rank #11 in the virtual meet. They are led by Mason Watkins with an impressive 16:40.00 season best. If Mason has a good day and he gets some help from Cameron Wilson, Charles Brice, and the rest of the Maroon Tide - they could find themselves in the top 10. A virtual meet shows the West Harrison girls finishing 19th. They'll be led by Layne Turan and Alyssa Chancey. The group is look for PR's and a strong finish to the year. The virtual meet has the West Harrison boys finishing 6th, and I know they'd love to crack the top 5. I think they'll do it too. They are led by two solid runners in Carlin Taylor and Tristan White. Both of these young men have a SB of 18:42. Hopefully they can push each other to a new season best and help the Hurricanes finish in the top 5, maybe even sneak onto the podium. Overall, I think Saltillo is too good to catch. I'm going to stick with the computer and figure Brookhaven will take second and Long Beach third. Boys - It's Saltillo again here. And I'm going with Brookhaven for second place just like the girls, but I'll take Natchez High School edging out Germantown for the 3rd place spot. That's it for now, I'll preview the 2A 4A 6A meet in my next article. See y'all at the trails.